In this black and white photograph, nine musicians are pictured playing instruments and singing aboard the ship, the S.S. Hamiltonian, ca. 1950. 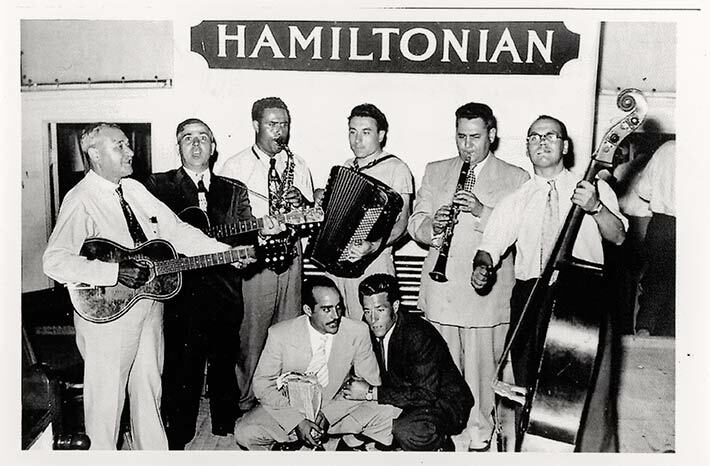 The two guitar players are identified on the back of the photograph as Antonio (Tony) Olivieri and Berlino Colangelo, two Italian Canadians from Hamilton, Ontario. Both, considered at threat to the Canadian state, were arrested and interned in 1940 without trial or explanation. The other musicians (unknown) are pictured playing the saxophone, accordion, clarinet and stand-up bass. According to the grandaughter of Antonio (Tony) Olivieri, Toni McDermott, the group regularly played on Saturday nights aboard the cruise ship. The ship sailed from Hamilton to Port Dalhousie while the Hamilton-based band provided entertainment for guests. (hand-written in blue ink) Playing guitars. / 1950's [underlined twice] / Lt. tony Olivieri / Berlino Colangelo / S.S. HAMILTONION - crosses the / harbour Hamilton to / Port Dalhousie / Entertaining musicians / always a fun loud / time.